Yea, it’s a little late, I had a majority written down since Sunday, just so busy. Leading up to States, I had been super confused on what to play. I had built and tested, LuxChomp, Gyarados, and a Rogue SP variant…I finally decided on a Gyarados list, which I’ll share, because unfortunately I was a break or two from the top cut. I thought the meta would have a little more Donphan then I saw, and while I saw LuxChomp, I didn’t play against a single SP all tournament. So the wife and I head on up to Fort Wayne, she’s playing Jumpluff/Luxray with limited practice, and meet up with Dustin Z, Kyle L, Alex L, and many mores and shoot the junk, while waiting for it all to start. We both get a relatively slow start. I start first with a Sableye start, and get online T3. He manually gets to an Ampharos from PL and hits Gyarados for 100. Next turn I drop Crobat G to hit Claydol to Bind his Cosmic Power, hit for 90, and get KO’d the next turn. I return KO, and from there it’s relatively easy. After killing his draw power, I get Luxray up, and jump around killing Mareeps as they hit the board. Probably the single most disappointed I’ve ever been with myself after a game is this one. I open super quick, and jump out to a huge lead. I Bright Look/KO a second Claydol midgame to get prizes to 4-1 in my favor and feel good. All that’s left after my KO was a Torterra, Meganium Prime and a Sceptile GE with a Bench Shield. The only problem was his board was clean of damage. His turn he KOs Gyara, and this is where my problem starts. 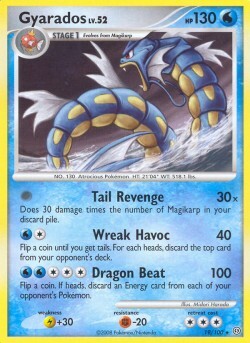 After I Cynthia’s and Cosmic, I can’t recover a Gyarados, so I mid-game Palmer’s when we’re at 3-1. He got Torterra X out of his prizes, levels up, uses Forest Murmurs to pull up Regice, and KO’s that and does 30 to Sableye to get it to 2-1. During his turn however to prevent my KO next turn he attached an Expert Belt to Sceptile. Somehow I did not notice this, until well, as I was standing up, which obviously, is unfortunately entirely on me. It completely wrecked my plan of Bright Looking Sceptile and using an Expert Belt for the win. I still Bright Look Sceptile and get a Gyarados online. Sceptile who has 20 resistance to Water, and now 120 HP (with 10 Damage on it, so 110) is not in OHKO range yet. I need to get to either my last Turn or my last Super Scoop Up essentially. I send Gyarados active, Pokémon Rescue my Crobat G, drop it to do 10, dump my hand, and get to my last Super Scoop Up, flip, and it lands tails. Still, even with it active I’m not noticing it has two tools on it. I attach my Expert Belt, and as I do he goes, Oh man I had you til that. I immediately (knowing I’m not hitting for KO) think time was called, and felt kind of bad, he then stated that I was now doing enough damage to KO Sceptile. I point out Sceptile’s resistance to which he says “Wow” I hit for 90, and he retreats Sceptile next turn, Forest Murmurs Crobat G, and gets 2 KOs with Vigorous Dash for the win. So now I’m super frustrated with my self as I immediately realize what had happened. But figure I can go 5-2 still and possibly make it. We draw, and I get what (at the time) looks like a good start. Felicities, Luxray GL Lv.X, Sableye, Call Energy, Pokémon Collector, Broken Time Space, Claydol. She mulligans and I see Kingdra, so I immediately know I am going to use Call Turn 1 to avoid getting donked. So we start, I attach Call and use it to look for Luxray and Baltoy. So while I call for these lovely characters I see that THREE Magikarp are prized, along with Luxray. Excellent. I grab Baltoy and Regice, and get ready to cry. She gets a Turn 1 Kingdra and KOs my Sableye. Next turn I use Collector for Azelf, Magikarp and Crobat G. I Time Walk for a Karp, discard it with Regice, and get a belted Gyarados up, which essentially makes Gyarados a 3HKO. I hit for 50. Problem for her though is she had seemed to already stalled, with two Kingdras and 2 Uxies on the board. She can’t discard and hits for 40. I drop Crobat and double PokéTurn it for enough damage to get the KO. I grab a Karp. Next turn she hits for 60. I successfully Scoop Gyarados next turn, and hit for 80. She again next turn pass/hits for 40. I KO Kingdra, and grab Luxray from prizes. She has completely dead drawn still, and hits with Psychic Restore for 20. I put Lux GL on bench, and KO Uxie to grab my finally Karp, she appears to top deck Baltoy with Uxie up front, but Baltoy gets Bright Looked next turn, and I finalize the comeback sweep two turns later. At this time Kyle L is 1-2 Alex L is 2-1, Dustin is 3-0 and Megan is 2-1. This is a relatively short game to explain. 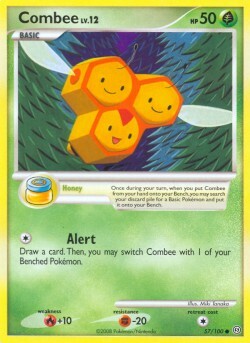 A key moment comes after he Cyber Shocks to discard two of his four energy. I Warp Energy to Lux, Bright Look the other Magnezone I’ve already hit for 90 that has his other two energy on the field, and complete s Luxray GL/Gyara sweep from there. Ugh, of course I get paired against Alex at probably what is the most crucial game of the tournament for me. He starts Tomb, but with almost nothing else. We get a good laugh when I Turn 2 Time Walk and see a Magikarp, my Luxray Line, and a Gyarados in there. He doesn’t get a Ghastly going until around turn three. I had already taken 2 prizes by the time he finally gets the Shadow Skipping into Mr. Mimes going. I get Luxray going though, and Bright Look/KO Claydol. I continue to Bright Look around his field until all that’s left is two Cursegars, and 2 Mr Mimes. I believe its 2-1 in my favor at this time. I whiff for a turn on a bunch of scoops and other various outs. I leave Luxray out knowing he’ll Level Down and KO it next turn, planning to Rescue it. I unfortunately completely miss the fact that my Claydol now has only 10 HP left. I whiff horribly on a Cosmic Power again drawing multiple Sableyes and such. I attach a Belt to Claydol, and attempt the only Scoop I could get too. I miss and he Compound Pains for the game. May not sound super intense from description, but as our games in Premier Events seem to go it goes down to 1-1 and is always a GREAT game. This deck is essentially a guaranteed autoloss. Let me essentially give you an idea of what happens. If I don’t fill my bench, he uses Darkness Restore to pull Karps out, making them near impossible to re-discard, AND lowering my damage output. AND if I do fill my bench, he dark palms Luxray or Claydol or Gyarados, and then Restores a Karp anyway! It’s a great idea obviously, I just ran into it at the wrong time. I take a quick lead taking 2 prizes, but he gets the chain going, and puts my damage output at zero, because even if I try to build a Luxray, he Dark Palms it. After getting a few laughs as I loudly attempt Sea Spray about 25 minutes into the round I scoop. I start T1 with a Magikarp with Call Energy. I call for Baltoy and Sableye, he gets a turn one Jumpluff, but seems to have over extended, as I get a turn three Gyarados and sweep two Pluffs and a small bench for a very quick game. So Kyle ends up being a 5-2 that misses, Megan 4-3, Alex goes 6-1 in Swiss and finishes in the T8, and Dustin goes 5-2 in Swiss, but beats Fulop in T2 to win the Indiana State Championship. All in all, I was pretty happy with my deck choice, and build, unfortunately I think I had a decent amount of “bad bounces” that kept me out of where I wish I could have been (top cut). Thanks for reading. See you at Regionals! Graham I'm kinda confused about your round 2 recap…was time actually called or did you just think it was called? Nice going on the winning record though and I know you'll do even better at regs. Adam – No it was not. I just thought for a second it was, until he started talking about how he thought the expert belt was the winning card. And hopefully I’ll be a force at Regs. Working on it. really good work there graham especially with no special techs for the gdos list. Tough matchups, having to play Alex and that Honch deck. Very tough match-ups for states but you seemed to play against them pretty well and you ended up with a winning record! Congrats and good job. My friend plays with the same exact deck besides a few cards as well. He added 3 more Crobat G's to be able to do the extra bit of damage sometimes. Good luck at regionals! Weird, thought I responded to this earlier. Adam – No time was not called, I thought that's why he was acting like I won, he thought the Expert Belt was the winning card though. Hopefully I can crush some regs action. Kyle – Yes, the Honch deck was near impossible, and Alex was winnable, and I did whiff a couple turns, but still a tough matchup/tough player. And I was so glad I put call in! CJ – Thanks for the good luck wishes, 2 Crobats would be where I would max out as I prefer to utilize my PokeTurns on Luxray, but that may be a play style preference. Yeah it probably is a play style. Another idea is to add cyclone energy, and maybe even some pokemon reversals as well to get some easy OHKO's. Just ideas.